Since September 11 they have decided to not have their yearly open house and instead of small group tours. They felt they could not control security with many of thousands of people around. Both the small tours like we took this time and the open house have advantages. At the open house you can talk to the scientists and engineers on the various projects. 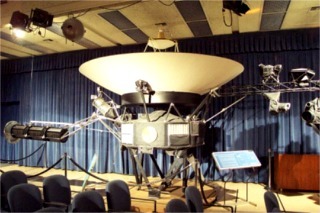 This is the Voyager spacecraft. Currently there are two of them traveling space. Launched in August and September of 1977. 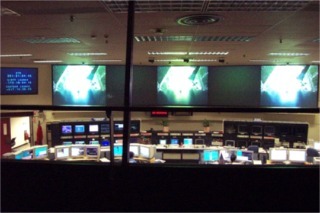 You start the tour in this room where you see a video narrated by Jodie Foster on the history of JPL. Next you go into a museum area on space. 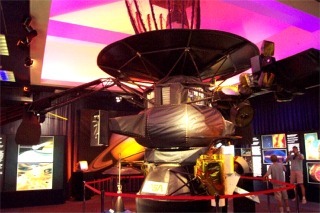 There is a full scale model of the Galileo spacecraft there. It was launched in October of 1989. It was bound for Jupiter. It also launched a space probe that descended to Jupiter. 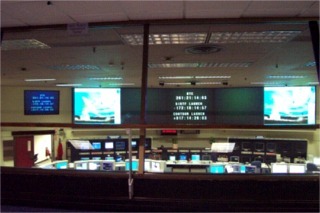 From there we went to Mission control where JPL is in contact with different spacecraft at all times. Mission control is manned 24 hours a day X 7 days a week by 365 days a year. They showed us a short video here also, a rocket launch from the rocket itself. Very cool. 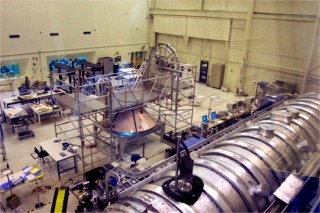 This is a clean room where they assemble spacecraft. In the middle of the room is the nose cone of a spacecraft. I'm not real sure why they need the clean room as they didn't explain it. There are 2 different levels of clean depending on what they are doing. One requires the elaborate suits the other just a covering over your clothes.